Auckland is a huge city with several district articles that contain information about specific sights, restaurants, and accommodation. Auckland is the largest city in New Zealand at 1.7 million citizens, and the main arrival point for visitors to the country. It is a vibrant multicultural city, set around two big natural harbours, and ranked as one of the most liveable cities in the world. It is in the warm northern part of the North Island, on a narrow isthmus that joins the Northland peninsula to the rest of the island. The central business district and central suburbs that made up the former Auckland City. It has many of the main tourist attractions and the bulk of accommodation options. Stretching from Orewa and the Hibiscus Coast in the north to Devonport on the North Shore in the south, North Harbour has the longest unbroken urban coastline in New Zealand. Devonport, ten minutes by ferry from downtown Auckland, is a popular day trip with its little cafes and Mt Victoria. The areas south and east of Central Auckland, including Manukau, Howick and Papakura. Dominated by the Waitakere Ranges, West Auckland (the old Waitakere City) offers many of the delights of New Zealand in a small area — unique trees and flowers, hiking and wineries. It’s also the gateway to the West Coast beaches like Piha and Muriwai. Auckland is New Zealand's largest city, home to 1.49 million people, nearly one-third of the country's population and more than the entire South Island. It is the main economic and travel hub, home to an international airport. It's lucky enough to have its own beautiful landscapes, waterways, and other attractions to draw tourists in. It is not New Zealand's political capital though – that honour goes to Wellington. Auckland is called the "City of Sails" for the large number of yachts that grace the Waitemata Harbour and the Hauraki Gulf, and for the city's love of sailing. More than 135,000 yachts and launches are registered in Auckland and several America's Cup regattas have been held here. Auckland could also be called the "City of Volcanoes". Much of its natural character comes from the fact that it is built on the Auckland Volcanic Field which consists of about 50 volcanoes. All of the volcanoes are individually extinct (Rangitoto was the latest to erupt, in the mid to late 15th century) but the volcanic field as a whole is not. The city also features a large number of urban beaches and parks, numerous arts and cultural institutions and events, and is home to a multitude of sporting teams. Auckland's multiculturalism is strongly being reflected at the birth registry office. In 2013, the most common surnames of newly born Aucklanders were Wang, Li, Chen, Liu, Smith, Zhang, Lee, Patel, Huang and Singh. Auckland is very multicultural, with strong immigrant cultures. Some 40 percent of Auckland's population was born overseas; in two local board areas, Puketapapa (Mount Roskill) and Howick, there are more overseas-born residents than New Zealand-born ones. It has the largest Polynesian population of any city in the world. For some Polynesian island nations, there are more expatriates living in Auckland than in their homeland. There is also a large population of New Zealand's native Maori people, and populations of immigrants and expats from the UK, China, India, South Africa, South Korea and the Philippines, among others. Auckland's rich cultural mix is celebrated with a wide variety of festivals and events throughout the city. Auckland by definition has a temperate climate, although it is often regarded by New Zealanders as having a subtropical climate. The city experiences four distinct seasons with warm summers and mild winters. Winter night temperatures rarely fall below 0 °C (32 °F). Auckland experiences regular rainfall throughout the year, with more in winter than summer, though it can also have periods of drought. Snow in Auckland is extremely rare - the last decent snowfall in the city was in the 1930s, although snow flurries have occurred in 1976 and 2011. -37.002174.7891 Auckland Airport. (AKL IATA). New Zealand's largest airport is located 22 km/14 miles south of central Auckland in the southern suburb of Mangere on the shores of the Manukau Harbour. There are frequent services from Australia and other New Zealand cities. There are also non-stop flights from locations in Asia, the Pacific Islands, the United States, Vancouver (Canada), Santiago (Chile) and Buenos Aires (Argentina). Air New Zealand flies right through from London (Heathrow Airport) with a stop in Los Angeles. Ground transport options from the airport to central Auckland include the SkyBus (NZ$18), shuttles (NZ$35) and taxis (NZ$35-65 ask for fixed fare; NZ$75-90 metered). -36.657174.6532 North Shore Aerodrome. Has a few flights from Kerikeri in the Bay of Islands, Tauranga and Great Barrier Island. The InterCity Sky City Bus Terminal at 102 Hobson St (behind Sky City Plaza) is the main hub for national coachline InterCity and its subsidiaries GreatSights and Skip Bus. Facilities include an InterCity ticketing office, free Wi-Fi, café and luggage lockers. The Northern Explorer train runs from central Wellington to -36.848123174.7762751 Auckland Strand Station on Ngaoho Place, in eastern central Auckland. The 681-km (423-mi) journey takes about 12 hours. The trip runs much of the length of the North Island with stopping-off opportunity at Tongariro National Park. In a single day you will pass every kind of scenery: coastline, volcanoes and mountains, green farm pastures and dense New Zealand bush from $119. The train leaves Wellington on Tuesday, Friday and Sunday, and returns from Auckland on Monday, Thursday and Saturday. Auckland is accessed from the south via State Highway 1. From Hamilton and New Plymouth you'll follow State Highway 1 north of Hamilton through northern Waikato and across the Bombay Hills into the southern suburbs of the city. From Tauranga and the Bay of Plenty, you'll follow State Highway 2 west of Tauranga to meet State Highway 1 at Pokeno, on the Waikato side of the Bombay Hills. From most other points south (including Rotorua, Napier, Palmerston North and Wellington), you will travel north to Tirau in the southern Waikato where you can choose between two routes; via Hamilton along State Highway 1, or via Matamata along State Highways 27 and 2. From Northland, you'll follow State Highway 1 to Wellsford. From there, you can continue to follow State Highway 1 to approach Auckland through the northern suburbs and over the Auckland Harbour Bridge. Alternatively, you can follow State Highway 16 to approach Auckland from the northwest via Helensville. 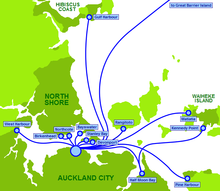 Auckland is a major cruise ship port of call with over 100 cruise ships a year. Auckland's main cruise terminal, Shed 10, refurbished in 2013, is located on Queens Wharf next to the central business district (CBD) and the Britomart Station. To get beyond the CBD, look for a bus called "The Link". The red city LINK bus runs along Queen Street and is only $1. The Link bus will always end up back at the place you started so you can never get lost - stay on the bus and see it all for one low flat fare. Explorer runs a hop-on, hop-off bus service. Taxis are relatively plentiful; many, such as those that serve the airport, accept credit cards. The AT HOP card is a prepay smart card for travel on bus, train and ferry services that costs $10. It gives free transfers and a significant discount off single trip adult cash fares, except for Airbus and NiteRider buses and Waiheke ferries. Bus and train fares use a zone-based system: fares start at $3.50 cash or $1.85 AT HOP for within zone journeys. For frequent travel on buses and trains, monthly passes can be loaded on a HOP card. These give unlimited bus (except Niterider) and train travel in defined zones. You must tag on and tag off each trip. A monthly pass pass for the entire network costs $210. Bus services cover most areas of Auckland. Between 2015 and 2018, the bus network was significantly overhauled, simplifying routes and extending frequent bus services, with the trade-off of having to transfer to a train, ferry or another bus to access the CBD from the outer suburbs. Routes with two-digit numbers run at least every 15 minutes daily between 7AM and 7PM; routes with three-digit numbers operate on lower frequencies. The City Link bus runs in a circuit from Karangahape Rd/Upper Queen St to Britomart or the Wynyard Quarter – it costs $1 cash or 50c with HOP (as of October 2016). The Inner Link is a loop service connecting CBD and the surrounding areas of Newmarket, Parnell and Ponsonby. It is fairly frequent and costs up to $3 paying with cash or $1.80 with HOP card. Northern Express (NX1 and NX2) buses run between the central city and the North Shore along the Northern Busway. NX1 services start at Lower Albert St near Britomart and terminate at Hibiscus Coast busway station. NX2 services start in Wellesley St between the universities and terminate at Albany busway station. They run every 3 to 10 minutes during working hours and no more than 15 minutes apart in the evenings and weekends. Last services leave between 11PM and midnight, with some NX1 services after midnight on Friday and Saturday nights (but only to/from Albany, not Hibiscus Coast). The Tāmaki Link runs every 15 minutes between Britomart, St Heliers and Glen Innes train station via Tamaki Drive, passing by Kelly Tarlton's. Route 18 provides a service every 12 minutes between Victoria St in the CBD and New Lynn train station, via Great North Rd, passing close to the Zoo and MOTAT. Travel by urban train is a good option, but only if you are near a train line; there are few lines and not all suburbs are served. Rail in Auckland has had a renaissance since the turn of the Millennium, especially after the central city terminus moved to Britomart in 2003. During 2014 and 2015 new electric trains replaced diesel trains, except between Papakura and Pukekohe in the south, where diesels still run. The Uber ride-sharing service is available in most of Auckland, and local service Zoomy is available in much of central Auckland. Auckland's many volcanoes offer great vantage points to take in the city and some of them have been turned into parks. Popular ones include Mt. Eden and One Tree Hill in Auckland Central and Mt. Victoria in Devonport. Auckland Domain is Auckland's oldest park and hosts weekend sports events. Includes the historically important winter gardens with impressive flower bed displays, tropical plants and statues (free). There are scenic views of the Waitemata Harbour and islands of the Hauraki Gulf from in front of the museum. Auckland War Memorial Museum, Parnell. The museum displays collections of significant importance at its prominent position in Auckland Domain. It was constructed in the 1920s as a war memorial to those that fought and died in theatres of war. The cenotaph located on the grounds below the steps leading up to the museum entrance is the focal point for annual ANZAC day remembrance services. The top floor records names in stone as well as sobering tombs and lists of war events and their locations. The museum contains excellent exhibitions of Māori and other Polynesian peoples' arts and crafts and daily Māori cultural performances as well as geography of the Auckland region. There is a planetarium and a cafe. $25 entry for overseas visitors, donation invited from NZ residents, free for Auckland residents. Auckland Zoo, Motions Rd, Western Springs. Auckland Zoo is home to the largest collection of native and exotic animals in New Zealand, set in 17 hectares of lush parkland and just minutes from central Auckland. Kelly Tarlton's Sea Life Aquarium on the scenic Tamaki Drive includes the Antarctic Encounter and Underwater World. It's an aquarium that includes a trip through a transparent tunnel while the fish and sharks swim all around you, and tanks of rays with feeding-time talks. New Zealand National Maritime Museum, cnr Quay and Hobson St, Viaduct Harbour. Interesting exhibits chronicle New Zealand's maritime history. Free entry for Aucklanders, $20 for other visitors. The StarDome Observatory on the slopes of One Tree Hill. The park also contains Māori archaeological sites, a kid's playgrounds, two cafes and a working farm. Movies. Ticket prices vary around Auckland. The cheapest are in the west, with adult tickets at WestCity in Henderson the lowest at $8.50, and a bit higher at $10 at LynnMall and Westgate. Hoyts Hibiscus Coast in the north on Whangaparaoa Peninsula is also cheap at $10.90. Elsewhere in Auckland prices are in the $18.50 to $19.50 range, except on Tuesdays when there is a $12.50 special (2017 prices). There are some good cheap food courts (food halls) offering a variety of usually Asian foods usually priced around $10. Try next to the Queens' Arcade at the bottom of Queen St (slightly hidden entrance), or the Metro award winning Food Alley (9-11 Albert St). Very good value and good quality predominantly non-Asian choices are available at Elliott Stables (39 Elliott Street, near Wellesley). Also on the same block is the Atrium on Elliott (21 Elliott Street), a good quality food court of predominantly Asian food. Check out the once-a-week night markets at various locations on different nights. Britomart Precinct on the waterfront in the city centre is home to an array of popular and diverse bars and eateries. Cafe Hanoi, Ebisu, Britomart Country Club, Mexico Giapo ice cream, to name a few. A must visit. Viaduct Harbour provides upmarket dining, starting at $30 for mains. While this area has some very nice bars and restaurants, be wary of restaurants lacking customers and usually very quiet. It may be a sign of below average food or poor service. Auckland is home to the University of Auckland, which is widely regarded as the top ranked university in New Zealand, and is consistently ranked by several ranking agencies among the top 100 in the world. Due to already high migration and stresses on local infrastructure in Auckland, the New Zealand immigration service makes it harder to obtain a work visa for those migrants wishing to work in Auckland. Accommodation can be found throughout the city, but the largest selection is in Central Auckland particularly the central business district. Like much of New Zealand, Auckland is overall a safe place to visit, particularly by most "western standards"; with a quality of life that's often ranks alongside cities like Munich, you can almost be certain that Auckland is not somewhere where people have to fear for their lives. With that said, theft and robbery rates are high compared to the rest of the country, and aggravated assaults are not unheard of. Make sure to take all the usual safety precautions. The only area locals will warn you about is South Auckland, which is widely regarded as one of New Zealand's most dangerous locations due to significant poverty rates. While it is nowhere nearly as dangerous as "rough" neighbourhoods in the USA or Europe, it is advised to remain on one's guards, especially at night. Some people might advise against going to West Auckland, an area once seen as being "rough around the edges" area, but has markedly improved over the years. There are many internet cafes in the CBD with prices ranging from $1 per half an hour to $5 per hour. Free internet is available from the public library (limited 100MB per IP address per day). There is also free Wi-Fi in the Skycity food courts. There are 40 HotSpots that offer Wi-Fi connectivity, most notably Esquires cafe (inside Skycity Queen St, Middle Queen St, Lower Queen St, Nelson St), Starbucks (Victoria St, K' Rd, Lower Queen St) and other cafes around Auckland. Austria, 22a William Pickering Drive, North Harbour, ☎ +64 9 476-0994, e-mail: austrianconsulate_auckland@xtra.co.nz. M-Th 10AM-noon by appointment. Honorary Consulate-General - the actual embassy is in Canberra, Australia. Accepts applications for new passports and identity cards but can not issue emergency travel documents. This consulate deals with Northland, Auckland, Waikato, Bay of Plenty regions and there are other honorary consuls in Wellington and Christchurch. Bangladesh, Apartment 7P Harvard on Hobson, 147 Hobson St, ☎ +64 9 302-0545, fax: +64 9 302-0549, e-mail: ataurrahman@xtra.co.nz. Mr Ataur Rahman, Honorary Consul. Barbados, 19 Vaughan Rd, Okura, RD2, Albany, ☎ +64 9 473-5949, fax: +64 9 473-5948, e-mail: FredWatson@xtra.co.nz. Mr Frederick Nelson Watson, Honorary Consul. China, 588 Great South Rd, Greenlane, ☎ +64 9 525-1588, fax: +64 9 525-0733, e-mail: chinaconsul_ak_nz@mfa.gov.cn. M-F 9AM-noon & 2-4PM. Greece, 108 Paihia Rd, One Tree Hill, ☎ +64 9 571-0238, fax: +64 9 571-0529, e-mail: nikosp@xtra.co.nz. M-F 9AM-4PM. Mr Nikos Petousis, Honorary Consul. Taipei Economic and Cultural Office, Level 18, 120 Albert St, ☎ +64 9 303-3903, fax: +649 302-3399, e-mail: tecoakl@taiwan-roc.org.nz. Go wine tasting on Waiheke Island. It's home to an abundance of art galleries, some fantastic wines and has some of the best beaches in the area. You can rent a scooter and get around the island fairly quickly. Can get crowded during the weekends, but very quiet during the week. It seems a world away from Auckland, but is only 35 minutes by ferry. Take a ferry to Rangitoto Island. Rangitoto Island has trails around much of the island, as well as a bridge that connects to the neighboring Motutapu Island, and is a great hike for even the most inexperienced hikers. Rangitoto Island has several lava caves that can be crawled or climbed through as well a spectacular 360 degree view at the summit (only about an hour hike on the most direct trail). This is one of the more convenient islands that is nearby as it is only 20-25 minutes by ferry. Rotorua, Hamilton, Waitomo Caves and Taupo are all within several hours drive and all have a lot to offer. This city travel guide to Auckland is a usable article. It has information on how to get there and on restaurants and hotels. An adventurous person could use this article, but please feel free to improve it by editing the page. This travel guide page was last edited at 07:58, on 9 February 2019 by Wikivoyage user Ground Zero. Based on work by Wikivoyage users Traveler100bot, Nurg, Ikan Kekek, Hiren.nz, Jontycrane, Yvwv, Lcmortensen and Graham87, Wikivoyage anonymous user 80.12.93.55 and others.